Eder Militao to Manchester United? How good is the young Porto star? With the help of WhoScored.com, we get the lowdown on what Brazilian defender Eder Militao could bring to Manchester United. It was a ninth successive league win comprehensively achieved. While their title rivals have slipped up in recent weeks, Porto have made no mistake in their quest to secure a second Primeira Liga trophy in as many seasons. Now six points clear at the summit, Porto haven't lost a league match since a 1-0 loss at domestic rivals Benfica at the beginning of October. The defeat was the shot in the arm required to get back to their best and sweep aside all before them. The 3-1 win over Nacional on Monday night further reinforced their credentials as title favourites and it would take a monumental downturn in form for Porto not to be crowned champions later this year. However, being the dominant side in Portugal is a bit different to achieving that in La Liga, Serie A or the Premier League and as commanding as Porto may be, any success will see a host of teams show an interest in their best players. Moussa Marega and Yacine Brahimi were both heavily linked with a move to West Ham last summer, while Chelsea were believed to have had a £20m bid for key creator and starting left-back Alex Telles rejected 12 months ago. It's an ongoing cycle that is unlikely to slow anytime soon, and the latest to be linked with a big money switch to one of Europe's big leagues is centre-back Eder Militao. A summer acquisition from Brazilian outfit Sao Paulo, the 20-year-old has adjusted seamlessly to Portuguese football. 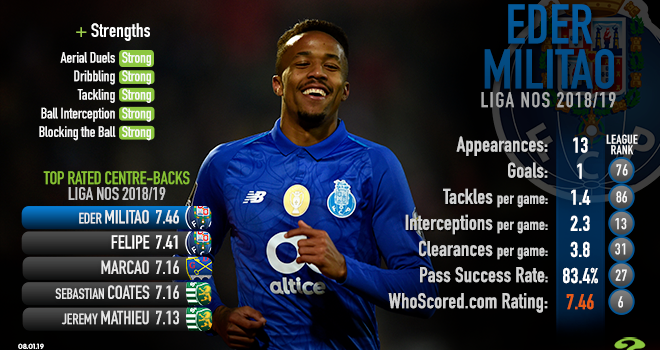 Used predominantly at right-back in the opening months of the campaign in Brazil, head coach Sergio Conceicao elected to start Militao at centre-back and Porto are all the better for it. Indeed, the youngster's WhoScored.com rating (7.46) is the best of all centre-backs in Portugal's top tier. As an Ivan Marcano replacement at the heart of the Porto backline, Militao has exceeded expectations at the Estadio do Dragao and his performances haven't gone unnoticed with both United and Liverpool reportedly interested in the Brazil international. Signed for a paltry €4m (£3.6m), Porto will make a huge profit on the defender as and when they decide to sell. Considering he is believed to have a £42.5m release clause in his contract, buying low and selling high seems to remain a staple for the Portuguese powerhouse. His aggressive style of defending has won him a legion of admirers in Portugal and seen him likened to the experienced Pepe. In 13 league outings this season, Militao has been dribbled past just once, making 18 of 19 attempted tackles to reinforce a statistically calculated WhoScored.com strength of 'tackling'. The approach he adopts, though, lands him in hot water with Militao committing more fouls (21) than he has made tackles (18) in the league this season, but at his age, it's a trait that can be ironed out over time. 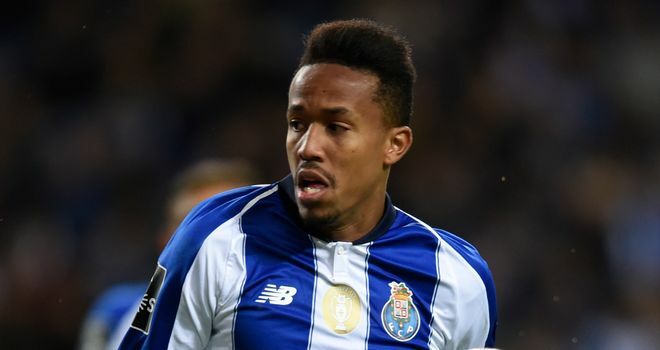 Is Eder Militao set for a transfer to the Premier League some time soon? The Brazilian's speed across the ground has proven crucial for a Porto side that has conceded just five goals in his 13 league starts, with Militao able to recover impressively when opponents do break the lines, while his reading of the game means he is able to realise the danger before it's too late. Aerially, too, he impresses, even though he stands at 6ft 1in. An aerial success rate of 67.2 per cent is notable given his height, but this is a shortcoming - no pun intended - that may be exploited in a more direct league. He works well with the tools he is handed, no less, yet it would be wiser to partner him with a centre-back that dominates in the air that would then allow Militao to maximise the stronger aspects of his game. This comes in his ability to bring the ball out from the back, though even here there is room for improvement. Porto have the second best possession return in Portugal this season, with 56.4 per cent, yet an 83.4 per cent pass success rate, while the fourth best of all players for the team, needs to be worked upon if he is to fully realise his immense potential. But at 20-years-old, time is on his side and the right coaching with the right defensive partner would help Militao take his game to the next level. Porto are understandably scurrying to hand him a new deal that would increase the £42.5m release clause in his contract, but from a financial perspective, they can't compete with the likes of United and Liverpool and this weighs against them. A word of caution, too, for English teams looking to spend big on Militao. Manchester City did so to sign Eliaquim Mangala back in 2014 and the Frenchman struggled to adjust to the Premier League. That being said, City courted Militao before his Porto switch last summer, perhaps with a view to playing him at right-back. His versatility - Militao is also able to operate in midfield - is an added bonus for interested parties. Militao would perhaps be better served continuing his education with Porto as he attains regular game time both domestically and on the continent, but when one of football's elite sides comes calling, it's difficult to turn them down. Militao, though, has shown more than enough to suggest he'd improve a number of Premier League sides and whether he moves this month or in the summer, he will be a welcome addition for any team.